Hallo there! 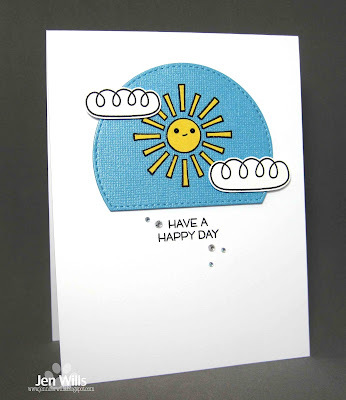 I've got a quick CAS card to share today for the current Inspired by Words challenge at Time Out. The stamps and the the stitched arch die are from My Favourite Things. I stamped the sun onto the blue die cut, then again onto yellow cardstock and cut and paper pieced it back on to the blue. The blue panel and the clouds are all popped up on foam tape and the sun is covered with clear Wink of Stella. Love how bright and cheery this card is Jen! thanks so much for playing with us at Time Out! Such a great way to interpret the quote. And a cute card! What a fun and happy card. Love this design. Thanks so much for playing along at Time Out. A card so "easy" for the eyes and so fun and fresh! Thank you for joining us at TIME OUT!